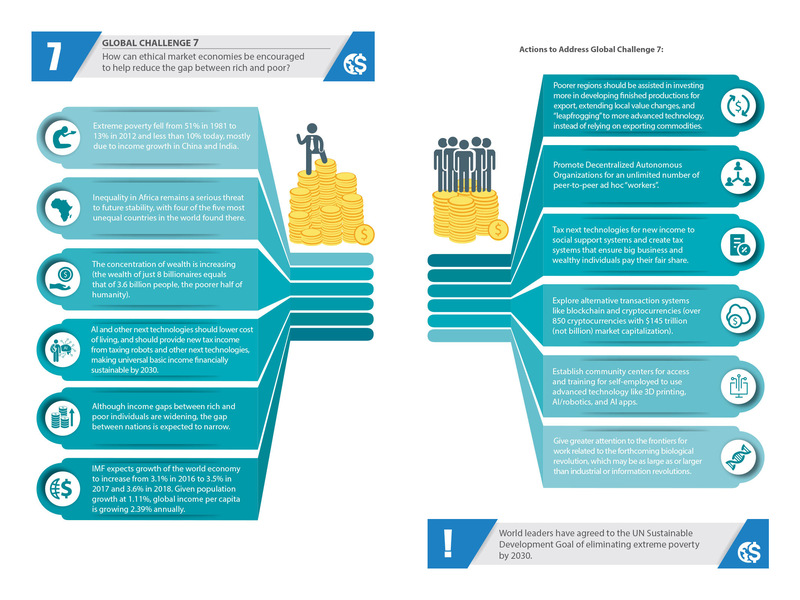 Global Challenge 7: How can ethical market economies be encouraged to reduce the gap between rich and poor? Extreme poverty fell from 51% in 1981 to 13% in 2012 and less than 10% today, mostly due to income growth in China and India. However, inequality in Africa remains a serious threat to future stability, with four of the five most unequal countries in the world found there. UNDP’s Multidimensional Poverty Index applied to 102 developing countries found about 1.5 million people living in multidimensional poverty. World leaders have agreed to achieve the UN Sustainable Development Goal of eliminating extreme poverty by 2030. IMF estimates Gross World Product will grow 3.1% in 2016 and 3.4% in 2017. Meanwhile, the concentration of wealth is increasing (the wealth of just 8 billionaires equals that of 3.6 billion people, the poorer half of humanity), income gaps are widening, employment-less economic growth continues, return on investment in capital and technology is usually better than on labor, and future technologies can replace much of human labor; hence, long-term structural unemployment seems inevitable unless new approaches to economics and the nature of work are created (See Chapter 4 on Future Work/Tech 2050 Global Scenariosand Strategies). Historically, inequality has been addressed through such mechanisms as war, revolution, debt relief, legal system reforms, tax adjustments, and land redistribution. Since artificial intelligence will reproduce and learn faster than humans, its universal proliferation seems inevitable. Algorithms are already out-performing humans in driving cars, face recognition, complex games, and even some forms of medical diagnosis. AI and other next technologies should lower costs of education, transportation, and medical care and should provide new tax income from taxing robots and other next technologies, making universal basic income financially sustainable possibly by 2030 (see scenarios in Chapter 4). Finland, Canada, and others are conducting pilot UBI experiments. Although income gaps between rich and poor individuals are widening, the gap between nations is expected to narrow. Emerging market and developing economies are growing around 4–5% annually, while more advanced countries are growing closer to 2%. IMF expects growth of the world economy to increase from 3.1% percent in 2016 to 3.5% in 2017 and 3.6% in 2018 [GDP may be a more useful measure for industrial economies than information economies. For example, the millions of people searching billions of computer pages totaling more than a trillion searches per year are not counted in GDP].Given population growth at 1.11%, global income per capita is growing 2.39% annually. Poorer regions should be assisted in investing more in developing finished products for export and extending local value chains instead of relying on commodities and “leapfrogging” to more advanced technology. Raise minimum wages and address executive wages. Consider seriously new progressively equalizing instruments, e.g. wealth tax and revising inheritance laws. Explore guaranteed income programs, as next technologies may lead to long-term structural unemployment, and create cash flow projections to explore financial sustainability of universal basic income. Tax next technologies for new income to social support systems and create tax systems that ensure big business and wealthy individuals pay their fair share. Invest in Kickstarter-like crowd sourcing to reduce the concentration of wealth. Explore alternative transaction systems like blockchain and cryptocurrencies (over 850 cryptocurrencies with $145 trillion (not billion) market capitalization). Explore global workforce sourcing solutions that overcome immigration and migration barriers to allow qualified workers to move where they can meet the vacant skilled labor requirements. Expand micro-credit and small business credit systems and business training. Conduct training programs on how to use mobile phone Internet access to find and develop markets worldwide instead of looking for non-existent local jobs. Establish community centers for access and training for self-employed to use advanced technology like 3D printing, AI/robotics, and AI apps. The capital requirements for start-ups are increasingly low—consider YouTube, Facebook, Uber, etc. Increase emphasis on science, technology, engineering, and mathematics education and lifelong learning and retraining. Create mechanisms to help people invest in automations that replace their job; e.g., truck drivers manage and invest into ownership of driverless trucks. Create personal AI/Avatars to support self-employment. Give greater attention to the frontiers for work related to the forthcoming biological revolution, which may be as large as or larger than the industrial or information revolutions. Establish Labor/Business/Government Next Technologies databases. By 2030, the global middle class is expected to grow by 66% – about 3 billion more consumers with increased purchasing power and expectations. According to the World Bank, the share of people in the world living on less than $1.9 a day fell from about 44% (1.99 billion people) in 1981, to 35% (1.85 billion people) in 1990, 12.4% (some 891 million people) in 2012, 10.7% (767 million people) in 2013, and the UN SD goal is to eliminate in by 2030. The number of people in the developing world living on less than $3.1/day declined from 2.9 billion in 1990 to 2.1 billion in 2012; the population of people in developing country has increased from 4.4 billion to over 6 billion over that period. The ILO reports that the number of working poor has also declining globally; from the early 2000’s to 2015, the number of workers living below $1.9/day declined from 33.2 per cent to 12.0 per cent, while the number of the workers living below $3.1/day declined from from 57.3 per cent to 27.9 per cent over the same period. ILO estimates that the rate of workers living in extreme poverty conditions will continue to decrease to some 7% by 2020. According to UNDP’s Multidimensional Poverty Index, about 1.5 billion people — a third of the population of the 91 countries covered by the index — live in multidimensional poverty and another 800 million people are highly vulnerable to it, and over 80% of the world’s population lack comprehensive social protection. The world economic agenda has become increasingly dominated by growing income and wealth disparities, the fast shifts in geoeconomic powers, and the potential impact that automation and other S&T applications will have on the job market and the living standards of the many. The gap between industrial and developing economies is expected to keep diminishing, with the emerging markets and developing countries continuing to grow considerably faster, given their increasing labor force and expanding market potential, versus the industrial economies, which are mostly replacement markets. As the economic power of the emerging markets grows, local brands are also increasingly taking over foreign companies, further consolidating the economic and political positions of their countries and unfolding new opportunities. Building on the success of the Millennium Development Goals, the Sustainable Development Goals will further engage the international community to reduce inequality within and among countries, with a more comprehensive approach that includes social, economic, and environmental dimensions along with increased accountability. By 2030, the global middle class is expected to grow by 66%—about 3 billion more consumers with increased purchasing power and expectations. According to the World Bank, the share of people in the developing world living on less than $1.25 a day fell from about 51% (1.93 billion people) in 1981 to 43% (1.91 billion people) in 1990 and to 17% (some 1 billion people) in 2011. The number of people living on less than $2/day declined from 2.59 billion in 1981 to 2.2 billion in 2011; world population increased from 4.5 billion to over 6.7 billion over that period. The ILO reports that the number of working poor has also been declining globally; from the early 2000s to 2013, the number of workers living below $1.25/day declined from more than 600 million to 375 million (12% of total employment), while the number of the workers living below $2/day declined from more than 1.1 billion to 839 million (27% of total employment). According to UNDP’s Multidimensional Poverty Index, about 1.5 billion people—a third of the population of the 91 countries covered by the index—live in multidimensional poverty while another 800 million people are highly vulnerable to it and over 80% of the world’s population lack comprehensive social protection. Economic gap among countries is diminishing: World output passed $100 trillion (PPP) in 2013, reached almost 108 trillion in 2014, and is expected to be close to 150 trillion by the end of 2020. The average annual growth rate has been 3.4% over the past three years and the IMF projects a steady economic growth of 3.5% in 2015, 3.8% in 2016, and 4% in 2020, while the World Bank expects a global economic growth at an average of about 3.3% through 2017. Advanced economies slow recovery: 1.8% economic growth in 2014 is projected to slowly pick up to 2.4% in 2015 and 2016, and 1.9% in 2020. The share of world GDP(PPP) of G7 countries has been decreasing from over 50% in 1990, to some 33% in 2014 and expected to further decrease to 29% in 2020, while that of emerging markets and developing economies has been increasing from 36% in 1990 to 57% in 2014 and pass 60% in 2020. GDP of the BRICS is expected to reach $36.43 trillion in 2015, surpassing that of the G7, which is projected to be some $35.86 trillion. In 2014, the BRICS established the New Development Bank headquartered in Shanghai with a regional center in Johannesburg, and a $100 billion Contingency Reserve Agreement to provide liquidity protection to member countries in case of need. The PwCprojects that by 2050, the world’s three biggest economic powers (PPP) will be China, India, and the U.S., each of them with a GDP greater than the next three largest economies (Indonesia, Brazil, and Mexico) combined. 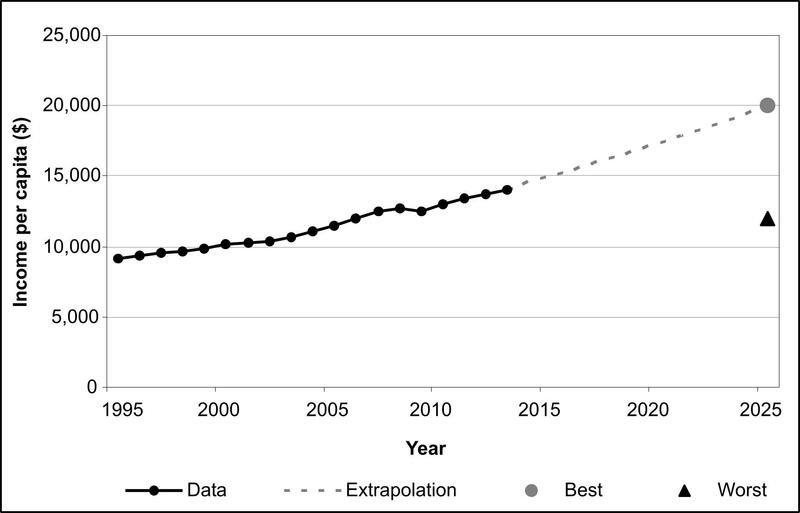 Per capita income gap will persist for the foreseeable future: Given the low economic starting point and their high population, emerging market and developing economies still have a long way to go for reducing the GDP per capita gap. GDP per capita of emerging market and developing economies grew at 3.5% in 2014 and is expected to continue at 3.1% in 2015, 3.6% in 2016 and 4.2% in 2020. This means that their GDP per capita will increase from $10,120 in 2014 to $13,841 in 2020. 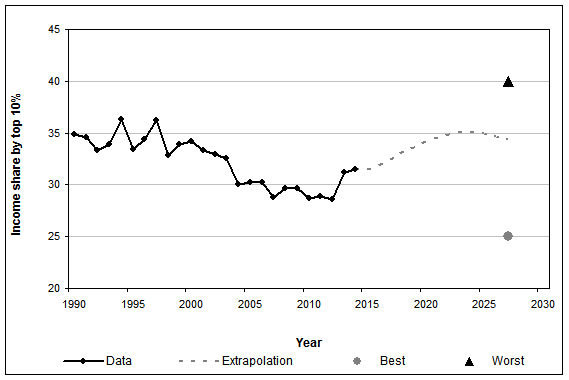 GDP per capita in advanced economies will grow considerably slower compared to emerging market and developing economies, at 1.3% in 2014 and projected at 1.9% for 2015 and 2016, and 1.5% in 2020. This means that their average GDP per capita(PPP) will grow from $44,588 in 2014 to $54.861 in 2020. Inequality is increasing globally and within countries: Increasing concentration of wealth is one of the main factors undermining the rich-poor gap reduction. The 2014 World Economic Forum identified income disparity as the most likely global risk over the next decade, while in 2015, unemployment and underemployment were seen as being both likely and serious. UNDP indicates that over the past 20 years, within-country income inequality increased by 9% in the developed countries and 11% in developing countries. About 75% of the households of developing countries are living in societies with higher income inequality today than in the 1990s. It notes that continuing current inequality trends versus the ‘best-ever’ inequality rate of each country could mean an extra 1 billion people living below the $2 per day poverty line in 2030.
Credit Suisse shows that by mid-2014, global wealth has reached $263.2 trillion, or some $56,000 per adult; however, $115.9 trillion of it is owned by the top 0.7% of the world population. Oxfam International remarks that if the 2010-2014 trends continue, by 2016, the richest 1% of the people will have more than all the rest of the world together. In 2014, the wealth of 80 billionaires equaled the total wealth of the bottom 50%, compared to 388 billionaires in 2010; their combined wealth reached $1.9 trillion–an average of $24 billion each, while the average wealth of the adults of the bottom 50% is barely $784. Across the OECD, the average income of the richest 10% of the population versus the poorest 10% is almost 10:1 today, compared to 7:1 in the 1980s and 9:1 in the 2000s. The ratio between wages and profit is increasingly and dangerously imbalanced, undermining long-term economic prosperity. Although financial leaders are placing inequality and structural reforms on the top of the world policy agenda, effective action has yet to be seen. Meanwhile, the 1% versus 99% movement entered the consciousness of the planet and question the integrity of financial leaders and the fairness of the current economic system calling for changes toward more sustainable prosperity. Agriculture: is the second-largest source of employment in the world, with almost 35% of the workforce (over 1 billion people worldwide). Its contribution to global GDP is only 6%, compared with 31% for industry and 63% for the service sector. The Bali Package adopted by the WTO in December 2013 is expected to address the “tariff quota”, land-use programs, export subsidies, and other measures that will improve developing countries’ access to world markets, while also addressing their food security. The most affected are the youth – aged 15–24, with some 74.5 million looking for work in 2014. Although some 40 million net new jobs are expected to be created yearly over the next five years, this does not meet the needs of an estimated 42.6 million people expected to enter the labor market every year. About 75%of the workers worldwide do not have a stable employment relationship. Some 48%of all employment is “vulnerable”, with most of those people having limited or no access to social security or secure income. About 21 million people are victims of forced labor, which generates and estimated $150 billion in illegal profits per year. The Global Slavery Index shows that more than 35.8 million people live in modern-slavery conditions worldwide. Employment opportunities: While unemployment persists, many businesses lack qualified workers. Hence, a better collaboration is needed among the private sector, civil society, government agencies, and education institutions to create the human capital with the qualifications needed by today’s and tomorrow’s job markets. ILO notes that some estimates show that spending 1.2% of GDP on active labor market policies could create an additional 3.9 million jobs in the developed economies and the EU region. Over 3 billion people connected to the Internet and more than 7 billion mobile subscribers provide an environment with unprecedented economic opportunities–limitless markets and possibilities for self-employment and SMEs to find markets rather than applying for jobs. New technologies and innovations are empowering people around the world, create new forms of business, raise productivity and free up important time for increasing human creativity and living standards. However, radical changes in the concept of work and profit sharing are needed so that the entire society benefits of the potential introduced by automation and AI. Some experts forecast that 50% of today’s occupations in corporations might no longer exist by 2025. This implies life-long learning and creative intelligence to continuously adapt to the fast changing technologies as well as to the new socio-economic structures of the evolving sharing economy. Trade is an important instrument to reduce the economic gap among countries: Presently, a third of goods cross national borders, and over a third of financial investments are international transactions. WTOindicates that in 2014, world trade increased at 2.8%. The value of world merchandise was $18.9 trillion in 2014, an only 0.7% increase compared to the previous year, given the falling price of some primary commodities; meantime, the value of commercial services increased 4%, to $4.85 trillion. Exports from developing countries grew at 3.3%, versus 2.2% from developed countries, while imports of developing countries grew at 2% compared to 3.2% of developed ones. The newly emerging-market middle class continues the development process through increasing local demand, while also moving lower-value jobs to other developing economies, thus spreading the prospects for global prosperity. Tax systems and financial regulations have not kept up with the complex growth of financial instruments requiring adjustments to ensure fairness. the trade finance facilitation programmes support over $20 billion of trade transactionsby SMEs in poor countries. However, the overall participation of LDCs in world exports remains marginal, at 0.7%, and with more than 70% of their merchandise exports dependent on a few main products. Although cautiously, WTO estimates that the world trade will grow at 3.3% in 2015, and 4% in 2016. Some McKinsey scenariosshow that by 2025, global flows could more than double or even triple compared to today, reaching $54 trillion to $85 trillion, due to growing participation of the emerging economies. According to UNCTAD, FDI decreased 8% in 2014 compared to 2013, to an estimated $1.26 trillion. Given the continuous global financial fragility and geopolitical turmoil, previous forecasts of $1.75 trillion for 2015 and $1.85 trillion for 2016 might be too optimistic. FDI to developed countries decreased another 14%, to an estimated $511 billion. In 2014, developing Asia has become the world’s largest investor region. Investment from trans-national corporation (TNC): in 2014, investment from TNCs from developing countries increased 30% compared to previous year, reaching some $500 billion, while that from developed countries TNCs at $792 billion was similar to the previous year. Official development assistance (ODA) by the 28 DAC countries reached $135.2 billion (net) in 2014, a 66% increased in real terms compared to 2000. Five countries continue to exceed the UN target of 0.7% ODA/GNI ratio. Some 66% of the ODA is bilateral, being directly channeled to partner countries. A DAC survey on donors’ plans for programmed aid to heavily aid-dependent countries revels that the declining trend in funding might continue to 2018, although ODA makes up some two-thirds of external finance to least-developed countries. OECD is also increasing its efforts to curb economic and financial crime, including illicit financial flows out of least-developed countries, that has major impact on development and financial sustainability. A better coordination among donor countries and programs is needed in order to assure long-lasting progress; although there are about 50 fragile states that depend on aid for a stabilization, between 2003 and 2012, 22% of all ODA to fragile states went to Afghanistan and Iraq. South-South cooperation continues to increase, reaching 10-15% of total official aid in 2013, although in real terms it is estimated to be much higher, as the valuation of their services tends to be lower than that of western contractors. Remittances–which are about three times the ODA and an important source for improving living standards in recipient countries — are expected to reach $615 billion by 2018 up from $575 billion in 2016, according to the World Bank. Crowdfunding is estimated to have reached $5.1 billion in 2013, and the World Bank estimates that crowdfunding investment in the developing world might be up to $96 billion by 2025, of which $50 billion in China. Geoeconomic transformation: The landscape of geoeconomic power is changing rapidly with the increasing influence of emerging economies, of multinational enterprises, and regional and local economic transformations. Half of the world’s major economies are multinationals; these businesses play a crucial role in poverty alleviation and building a sustainable economic system. Out of the total 603 regional trade agreement notifications, some 400 have been in force at the end of 2014, with about half of them happening over the past decade. As regional trade agreements interlock, the scope and spectrum of multilateral trade processes will continue to expand, increasing productivity and living standards in many developing countries, mainly through outsourcing of manufacturing and service jobs to low-wage high-tech economies. By 2025, 66% of world’s economic growth is expected to be driven by the world’s richest 600 cities (measured by absolute GDP). Out of the 25 top growth-contributing cities, 21 will be in emerging economies (a significant number of them in China), compared to today’s 4 of the 25 wealthiest cities located in the developing world. Unless better urban policies, over the next 20 years, the number of city dwellers might reach five billion (60% of the world’s population), the majority in the developing world. Approximately 1 billion people in 96 countries now belong to a cooperative, according to the International Co-operative Alliance. New measures of progress: New indicators that look beyond GDP are being developed, which measure progress and prosperity form multiple aspects, including social and economic inclusion, governance, and the environment. They help understand the interplay among various factors and assist policymakers with setting priorities, reshape economic policies, and improve governance. Some of the most popular new indicators considered are: Human Development Index, the Better Life Index, the Sustainable Governance Indicators, the State of the Future Index. Richer countries used to send money, talent, and equipment to help poorer countries with mixed results; pay-for-performance is now being explored. Long-term strategic plan for equitable economic development: The world needs a long-term strategic plan to develop a global partnership between rich and poor. Some long-needed economic reforms could provide new funding sources for a harmonious and sustainable development, to reduce income inequality, and eventually create a basic guaranteed income for everyone to have a decent living-standard. OECD calls for policies which ensure that wealthier individuals and multinational firms pay their fair share of taxes. Some estimate that a tax on international financial transactions might generate up to $250 billion per year. Outlaw tax havens, which are one of the most significant lost government financing sources. Tax Justice Network estimats that tax heavens harbored some $21-32 trillions at the end of 2010 (almost 10 trillion owned by only 100,000 people). A conservative (no growth rate applied) projection to today’s GDP would mean $30-$40 trillion, or some 25% of world’s GDP. Hence, outlawing tax havens could generate some $10-$15 trillion (considering a 30% tax) for social and economic programs. Global Financial Integrity estimates that illicit outflows from developing and emerging economies totaled some 6.6 trillion between 2003 and 2012, at an average yearly growth rate of 9.4% (over twice the global GDP growth.) In 2012 (latest year with available data), the illegal capital outflows from these countries were estimated at $991.2 billion, including tax evasion, corruption, and other illicit activities; that’s almost 8 times the total ODA for that year. The Stolen Asset Recovery Initiative (StAR)–a WB and UNODC partnership to identify and return of stolen assets–estimates that some $5 billion has been recovered in the period 1995-2010. Some argue that an endowment to help finance the SDGs by the 1,826 billionaires that have a net worth of $7.1 trillion, with a 5% payout ratio would generate $355 billion a year. A dividend on the wealth growth of the richest individuals–as an adjustment of income to productivity growth– could be another important source to help address income and development gaps. The UN Global Compact has more than 12,000 participants, including over 8,000 businesses in about 145 countries, combining business interests with global priorities to help poverty alleviation, climate change mitigation, and women’s empowerment, while protecting children’s and labor rights, and fighting corruption. Such Conventional approaches to poverty reduction (technical assistance and credit) that work in low- and middle-income stable countries do not work in fragile countries, which need stability first. The Post-2015 development agenda envisions increased partnerships among all actors, mainly with the private sector, emphasizing the role and accountability of large corporations concerning their social and environmental impact. Ethical market economies require improved fair trade, increased economic freedom, a “level playing field” guaranteed by an honest judicial system with adherence to the rule of law and by governments that provide political stability, a chance to participate in local development decisions, reduced corruption, insured property rights, business incentives to comply with social and environmental goals, a healthy investment climate, and access to land, capital, and information. Challenge 7 will be addressed seriously when market economy abuses and corruption by companies and governments are intensively prosecuted and when the inequality gap — by all definitions — declines in 8 out of 10 consecutive years. Sub-Saharan Africa: Sub-Saharan Africa is the world’s second-fastest growing region, with half of today’s 30 fastest-growing economies. If these trends continue, there could be one billion people in the middle class by 2060, up from today’s 313 million people (34% of the region’s population). However, half of the current middle class is significantly dependent on African diaspora; remittances to the region are projected to reach $33 billion in 2015–more than Africa receives from foreign aid–and continue to grow to to $34 billion in 2016 and $36 billion in 2017, highly facilitated by the adoption of mobile money transfer services. Since the late 1990s, Africa experiences sustained economic growth of about 5% annually. The IMF projects that Africa will be the world’s second-fastest-growing region in the period to 2020. The AfDB projectsthat the economic growth is more broad-based, driven by increased continental trade and domestic demand, and infrastructure development. Yet, current per capita income levels remain low due to population growth and high income disparities—100,000 people hold 80% of the wealth, according to AfDB. Although for the first time since 1981, less than half (48%) of Sub-Saharan Africa’s population is living below $1.25/day; the number of the region’s extremely poor doubled over this period, from 205 million to 415 million in 2011, representing about 35% of the world’s extreme poor. The WB optimistic forecast is that extreme poverty rate will fall to between 16% and 30% by 2030. Also, the average income of the extremely poor remains at approximately half of the $1.25/day threshold, with the region having the countries with the highest rates of intensity of deprivation of population living in multidimensional poverty and the countries with the highest inequality in the world—Central African Republic, Sierra Leone, DRC, Niger, Chad, Guinea-Bissau, and Guinea. Since one in every three births will be African by 2050, and almost one in three children under the age of 18 will also be African, unless jobs creation and new forms of cyber self-employment increases considerably, poverty and social instability could be rampant. Dependency on commodities with fluctuating prices, lack of infrastructure, and rampant corruption make economic growth and development challenging. FDI to Africa rose from $15 billion in 2002 to $42.5 billion in 2014. China is Africa’s largest trading partner, financier of infrastructure, and lender to its governments. Intra-African trade continues to account for only 10% of exports on the continent and is too weak to be an incentive for changing trade patterns. This might change with the Continental Free Trade Area expected to be set in 2017, and a regional financial integration planned by 2025 (although the African Central Bank and a single African currency expectations have been postponed to 2030).The trade finance programme introduced by theAfDB in 2013, able to support up to $1 billion in trade at any time, has been expanded in 2015 to further help SMEs across the continent. There is an increase in the promotion of small and micro enterprises through policies and funds, but township and local innovation systems are also needed to help reduce the rich-poor gap. Urban farming in the Democratic Republic of Congo is converting many unemployed people into small farmer entrepreneurs. Meantime, approximately 56.2 million hectares (5% of Africa’s agricultural land) is subject to land-grabbing, further threatening the livelihoods of the already poor. For a steady development, the region should address in a systemic way its complex challenges: poor governance, corruption, high birth rates, gender inequality, income and location biases, weak infrastructure, high indirect costs, armed conflicts, environmental degradation and climate change, poor health conditions, and lack of education. Middle East and North Africa:The MENA region has extraordinary potential for development given its young workforce, oil-rich countries, and economically-strategic position — between booming Asia, fast-developing Africa, and advanced Europe. However, chaotic geo-politics with years-long turmoils across the region, volatility of oil prices, and slow pace of reforms impede a sustainable social and economic development. The drop in oil price from$110 a barrel in June 2014 to less than $55 at the end of March 2015 hugely impacted the budget of the oil-exporting countries that are based on redistribution of oil revenues rather then a sustainable economy. After the 2013 and 2014 economic slow down (at 2.3% and 2.4 % growth respectively), the IMF forecasts continued modest economic growth at an estimated 2.7% in 2015, 3.7% in 2016, and some 4% in 2020. In some Arab countries, 50-80% of the workforce is employed by the public sector. Unemployment has been increasing over the past years, reaching 9.1% for male and over 21% for female in 2014. Youth unemployment is over 27% and ILO projects that it might reach 28.6% in 2018. The Arab Labor Organization estimates that a 1% increase of unemployment rate reduces GDP by 2.5%. Some 2.2 million people of the region live in modern slavery, with prevalence of over 1% in Qatar, Syria, UAE, and Iraq. Remittance inflows to MENA are expected to grow from an estimated $53 billion in 2015 to $55 billion in 2016 and $57 billion in 2017. Egypt accounts for some 40% of total remittance inflows to the region. The Arab Spring created momentum for building a more open economy and democratic society, but economic reforms are slow or non-existent across the region. Structural reforms and change of mentality to develop opportunities and the entrepreneurial spirit of the youth, and to create a climate favorable to SMEs are imperative. Israel’s strong economic development continues thanks to a favorable entrepreneurship climate and great support to innovation. Asia and Oceania: Asia’s economy surpassed that of the EU or NAFTA and although the historic speed and volume of Asia’s economic growth has begun to slow, it remains a major factor in the geoeconomic transformation. Asia’s middle class is expected to grow from the current 500 million to 1.75 billion by 2020. The ADB projects that developing Asia will maintain its GDP growth at 6.3% in 2015 and 2016, similar to 2014, while the WTO expects Asia’s exports to continue to outpace the rest of the world, at rates of 5% in 2015 and 5.4% in 2016. In 2014, developing Asia continued to be the word’s largest FDI recipient, with $493 billion, and has also become the world’s largest investor region, with $440 billion. The region has $4 trillion in fiscal revenues, $6 trillion in private savings, and the region’s richest had $35 trillion financial assets in 2013. China is now the world’s largest economy (in ppp terms) but the IMF expects its economic growth to slow down from 7.42% in 2014 (considerably slower than the average 9% since the global financial crises) to 6.8% in 2015 and 6.3% in 2016 and 2020, while the Economist Intelligence Unit is expecting China’s economic growth to slow down to 5.9% in 2018. This may not keep pace with employment needs and China’s leader’s goal to double its GDP and income per capita for both urban and rural residents by 2020. China has more than one million millionaires and adding more than any other county. Although China brought more people out of extreme poverty than any country in history, reducing its extreme poverty rate from 84% of population in 1981 to 12% today, some 80.8 million people are still living in multidimensional poverty and 19% of the population is near multidimensional poverty. India has 26% of the world’s extremely poor ($1.90/day), and about 632 million people in multidimensional poverty (health, education, living standards composite index) . However, India’s middle class has grown to over 300 million people, unemployment rate is only about 5% — some 45 million people unemployed, and the IT sector which employs about 2.2 million directly and 8 million indirectly is expanding rapidly. India’s economic growth is expected to continue, from 7.4%in 2014 to 7.8% in 2015, and 8.2% in 2016, as result of structural reforms.India has a National Rural Employment Guarantee Scheme under which a villager who needs work is guaranteed hundred days of work in a year at the fixed minimum wage. This programme is a decade old, and the government has spent the equivalent of US $ 52 billion dollars on this program in the 2006-16 period. ILO notes that over 90%of workers in China and India are without permanent contract. India and China are the world’s largest remittance receivers, with $70 billion and $64 billion respectively, in 2014. Remittances to East Asia and Pacific region are projected to continue to grow from an$123 billion in 2015 to $130 billion in 2016 and $135 billion in 2017, while those to South Asia are projected to reach 120 billion in 2015 and grow to $126 billion in 2016 and $132 billion in 2017. Remittances are extremely important to some countries such as Pakistan, Sri Lanka, Nepal and Bangladesh, where they exceeded 6% of GDP in 2013. In Bangladesh, some 50% of the population–75.6 million people– are in multidimensional poverty. The 10 ASEAN economies are expected to experience a combined economic growth of 4.9% in 2015 and 5.3% in 2016, with the establishment of the ASEAN Economic Community. The Asian Infrastructure Investment Bank (AIIB), with China and India the largest investors by far, is expected to be operational by the end of 2015. China, Japan, and South Korea are negotiating a Free Trade Agreement.This would be one of the biggest free trade areas, accounting for 70% of Asia’s and 20% of the world’s GDP, and representing 35% ($5.4 trillion) of world’s trade. A larger Asian economic integration with ASEAN, an Asian Monetary Union, and an Asian Union are also in discussion. The search for lower labor costs and China starting to outsource manufacturing continues the intraregional restructuring. The informal economy remains widespread across Asia, with rates in some countries of South and South-East Asia up to 90% of total employment. Structural financial reforms are needed to support further development and investment. Increasing geopolitical tensions in the Asian region, plus corruption, organized crime, pollution, growing rich-poor divides, potentials for increasing shortages of water, energy, and food make continued poverty reduction difficult. Natural disasters and the effects of climate change are threatening the development and the very existence of entire Pacific communities. Thus, there are speculations that the Asian economy as-a-whole might not surpass a middle-income level in the foreseeable future. Japan remains the most developed country in the region. Its economy, complicated by the Fukushima nuclear disaster, isexpectedto improve after a 0.1% contraction in 2014, by a 1% and 1.2% growth in 2015 and 2016 respectively. Europe:The EU is one of the richest regions in the world with a GDP of €14 trillion (~$15.6), but concerns remain about eurozone countries’ debt and direction of fiscal policy. The economy is expected to grow by 1.5% in 2015 across the EU, but only 1.1% in the eurozone, where unemployment is projected to remain at about 11%. Across the EU, unemployment rates vary from around 27% in Greece and Spain, to about 5% in Austria and Germany, but youth unemployment is close to 50% in some countries. The EU estimates annual youth unemployment costs at €153 billion in lost wages and taxes; however, the program of guaranteed jobs within 4 month after ending formal education has yet to be implemented by countries. The EC’s €315 billion Investment Plan designed to provide economic stimulus could create over 2.1 millionnew jobs by mid-2018, notes the ILO. However, since the 2008 economic turmoil, labor protection has generally decreased. The divide between the creditor countries in the north and the debtor nations in the south continues to widen. The eurozone leaders adopted a set of short- and long-term measures to save the euro and stimulate economic growth and are discussing several proposals, including a financial transaction tax across the eurozone, more centralized supervision of banks, issuance of eurobonds, and enacting a common minimum corporate tax to reduce losses to tax havens across the region. The crisis also triggered negotiations over structural reforms, which might include a tighter political integration with more solidarity and concessions on fiscal sovereignty. The Market in Financial Instruments II reform is intended to regulate financial markets and commodity prices across the EU, to prevent market distortions and abuse. The economic costs incurred by corruption in the EU are estimated at €120 billion (~ $163.8 billion) a year (close to the total EU annual budget), and some 40% of the companies participating in an Eurobarometer survey consider corruption, nepotism, and patronage to be an impediment for doing business. This is expected to be addressed by the comprehensive anti-corruption package adopted by the EC in 2011. Collectively, the EU is the world’s largest aid donor, for a total of €58.2 (~$65) billion in 2014 (including the European Investment Bank contribution), with five countries–Denmark, Luxembourg, Norway, Sweden, and the UK–exceeding the UN 0.7% ODA/GNI ratio. The EU’s 11th European Development Fund that entered into force in 2015 totals €30.5 (~$34) billion, dedicated to financing development cooperation projects until 2020 in African, Caribbean and Pacific countries, and Overseas Countries and Territories to help eradicate poverty and achieve the SDGs. With only7% of the world’s population, the EU accounts for around 20% of global trade, is the world’s third largest investor region with $286 billion in 2014. FDI inflows to the EU were $267 billion in 2014, a 13% increase compared to 2013. Economic growth of the CIS (excluding Russia), after a slow 1.9% in 2014 and an expected 0.4% in 2015 is projected to pick up to 3.2% in 2016 and 4.3% in 2020. Russia is the world’s largest country and has the fifth largest economy, but its recent economic development has been severely affected by low commodity prices, falling foreign investments, Western sanctions imposed in 2014, and restricted access to foreign loans and new technology.After a 0.6% economic growth in 2014–the lowest since the recession–its GDP is expected to contract by 3.8% in 2015 and 1.1% in 2016, to eventually pick up to 1.5% in 2020. Unemployment rates passed 5.5% in the first quarter of 2015. In February 2015, the government allocated 2.3 trillion rubles to an anti-crises plan. However, due tointernal constraints such as unfavorable business environment mainly to SMEs, too much bureaucracy, and high inflation, it is difficult to stimulate growth. In 2014, FDI from the Russian Federation accounted for 92%of the total $55 billion flows from transition economies. Latin America:Even though the region’s middle class has grown 50% over the past decade, it remains a highly unequal society, with the richest 10%receiving about 48% of total income versus the poorest 10% that is only getting some 1.8%, and with continued social segregation based on income, geographical area or indigenous status. Nevertheless, during the 2000s, inequality declined considerably, including between rural and urban incomes. Yet, aWorld Economic Forum survey has found that on average, 64% of Latin Americans think that their country’s economic system favors the wealthy, with the rates varying from 86% in Chile, to 32% in Venezuela. Chile and Mexico are the OECD countries with the highest income inequality. In Brazil and Mexico, inequality is at the lowest level since the 1960s when data records started. Some 40% of social inequality reduction is due to lower wage inequality, increasing number of skilled workers, and increased minimum wages, while another 13%-20% is due to more progressive government transfers. Decreasing inequality also accounts for 33%-50% of the poverty reduction in the region. The share of people living below $1.25/day dropped from approximately 12% for the last two decades of the 20th century to 6% now. However, the continuous economic deceleration since 2011 is expected toincrease unemployment from 6% in 2014 to 6.2% in 2015 according to ILO/ECLAC. Remittances are an important source for poverty reduction in some countries. Inflows are expected to grow from estimated$66 billionin 2015 to$69 billion in 2016 and $71 billion in 2017. Mexico, with $25 billion received in 2014 was the largest recipient of the region and 4th largest in the world. Brazil reduced the number of people living in poverty from 41 million in 2002 to 15.7 million in 2013; the middle class increased by 42 million people since 2003, and income per capita grew by 78%; it pledges to continue creating an investment-friendly economic environment and to use its rich natural resources to improve living standards sustainably. Peru has reduced its poverty rate from 59% in 2004 to 28% in 2012, but lack of opportunities increases the number of young “backpackers” working in drug-trafficking. The Community of Latin American and Caribbean States (CELAC) pledged to continue the efforts for poverty eradication and reduction of inequalities by increasing regional economic, social, and political integration. After a decreasing rate of 1.3% in 2014 and an estimated 0.9% in 2015 (compared to 2.9% in 2013), IMF projects the region’s economic growth to remain relatively slow, at 2% in 2016 and 3% in 2020. According to OECD, less than 4% of state revenue is generated by personal income taxes, compared with 27% in industrialized countries, while VAT is placing an additional burden on poor customers. The “shadow economy” is estimated to be about 40% relative to the formal one. Fiscal and economic reforms are improving stability, although country and regional policies increasingly focused on national interests and ethical behavior might affect future foreign investments. After four years of consecutive growth, in 2014, FDI decreased by 19%, to a total $153 billion (from 190 billion in 2013) mainly due to the fall in commodity prices. The EU isthe main development partner of the LAC region, its first investor, and second trading partner and their relations continue to strengthen. 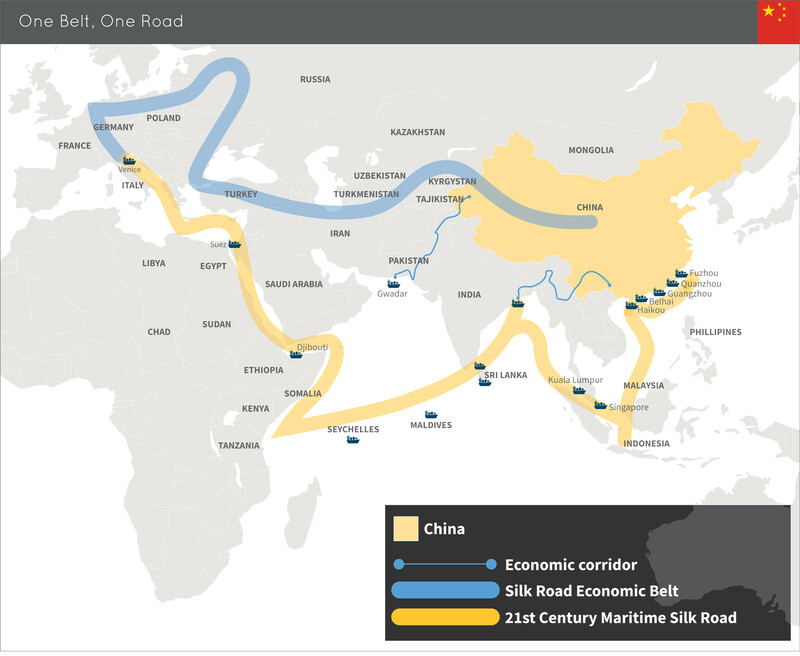 China becomes an increasingly important player in the region and it might become LAC’s largest trading partner by 2017, as it continues major investments and expansion of trade with different countries (including a proposed $20 billion to finance infrastructure in the region), and its regular participation in regional forums, including CELAC. 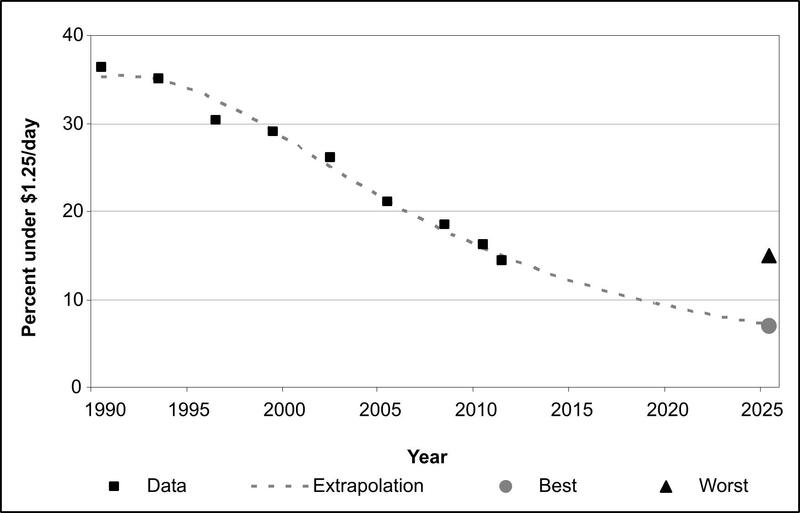 North America: 84% of people working in the US today will still be on the job 10 years from now and 66% will still be there in 2035; however, if artificial general intelligence is created in 2030, this percent could change. The U.S. slow but steady economic recovery keeps it as the leading world economy and is likely to continue to be so for the foreseeable future, mostly due to its entrepreneurial spirit that encourages creative intelligence, and welcoming policy for immigrants with advanced technical degrees.GDP is expected to continue growing, from 2.2% in 2013 and 2.4% in 2014, to 3.2% in 2015. By November 2016, the U.S. unemployment rate fell to 4.9%, although youth unemployment is 12%, many of whom finished university with high debts and few jobs matching their qualifications. Raising the minimum wage is long over due. The first three years of economic recovery (2009-2012) benefited mostly the rich, with the average income of the top 1% increasing 36.8%, while that of the bottom 99% fell by 0.4%, continuing to widen the rich-poor gap. In 2011 and 2012, the official poverty rate was 15% (46.5 million people), 2.5% higher than in 2007, before the recession. A World Economic Forum surveyhas found that North Americans see increasing inequality as the most important challenge facing their region. From 1978 to 2013, for the top 350 U.S. firms, the compensation of CEOs increased 937%, versus 10.2% growth for a typical worker’s compensation, with the CEO-to-worker compensation ratio reaching 511-to-1 in 2013 (compared to 20-to-1 in 1965). Meantime, since 2000, the gap between GDP and employment growth has been widening, increasing concerns over technology eliminating more jobs than it creates. One projection estimates that automation might replace 45% of jobs in the U.S. over the next 20 years, most of them at the middle tier. Increasing profits at the expense of lower wages is not sustainable and undermines markets at home, as well as people’s confidence in the system. The U.S. is the world’s top investor, with $337 billion in 2014, but its inflows dropped to $86 billion, putting it on 3rd place after China and Hong Kong. Its trade deficit is over $500 billion, some 70% of it from business with China. The U.S. continues to provide the largest single country ODA, for a total of $32.73 billion in 2014. Although controversial, potential trade agreements such as the Transatlantic Trade and Investment Partnership with hundreds of amendments and the Trans-Pacific Partnership might open new global economic opportunities. Intra-NAFTA (Canada, Mexico, and USA) trade has tripled over its 20 years of existence, helping continental economic integration. The most important economic engines of Canada are the small businesses, representing some 98% of all businesses and employing over 60%of the workforce. Altogether, SMEs employ some 90% of the Canadian workforce. The Business Barometer Index shows a nationwide relatively high small business confidence of 60.6 average, varying from 73.5 in British Columbia, to 45.7 in Alberta (where oil-dependency impacts the entire economy). However, some argue that Canada’s income gap is widening, with the richest 10% holding some 60% of financial assets, more than the rest of 90% of Canadians combined, while the poorest 20% own less than 1% of the wealth and have more debt than assets. The livelihood of 400+ remote communities in the boreal and Arctic regions remains problematic and unaddressed. The merger of the Canadian International Development Agency with the Department of Foreign Affairs, International Trade and Development indicates a new approach to aid, by also including commercial and foreign-policy objectives to programs, rather than exclusively humanitarian ones.